In the foreword to Cartoon Roots’ spookiest installment, Halloween Haunts, historian/preservationist/curator Tommy José Stathes describes his first exposure to early cartoons on VHS. This is probably a shared experience for many animation fans of a certain generation; my own first contact with pre-Looney Tunes animation came from budget-priced videotape compilations sold by the registers at my hometown grocery store. (That, and courtesy of the King of Cartoons on Pee-Wee’s Playhouse.) I’d later spend four years working in a university’s film archive, taking notes on box after box after box of donated film reels. Hunched over a console in a tiny room with a stack of reels that reeked of vinegar, finding a cartoon always felt like stumbling on treasure, be it a mislabeled Merry Melody or disintegrating Silly Symphony. Later, YouTube came along to host many previously-scattered public domain ‘toons in one place, but often in unfortunate conditions. Early animation is an area of cinema history that, for mysterious reasons, seems to have gotten the shaft when it comes to preservation. (It’s baffling when even a massive powerhouse like Disney seems content to let its earliest works languish in obscurity.) It’s why cartoon fans should be grateful for the efforts that go into a release like Cartoon Roots: Halloween Haunts. Halloween Haunts is a collection of 15 short films – most animated, or at least heavily featuring animation – lovingly restored in 2K from 16mm prints. This collection was inspired by Stathes’ annual live show in NYC, which presents seasonal ‘toons with live piano accompaniment. Maintaining that musical tradition here, silent shorts are presented with new scores that fit the period. The supernatural has been a popular subject for almost as long as cameras have existed, if the prevalence of ghost imagery in widely-sold, late 19th Century stereoviews is any indication. The camera’s ability to easily play tricks on the eye is likely to thank for this and it’s no wonder the practice carried over to early film. The collection’s two earliest pieces, The Haunted Hotel and The Pumpkin Race, both from 1907, get up to much in-camera tomfoolery. The latter uses some endearingly rudimentary stop-motion to make rolling pumpkins cause havoc through city streets appearing as if they have a mind of their own. The Haunted Hotel, though, is a brilliant little discovery – cinema’s first stop-motion horror movie, though more of the humorous than horrifying variety. This film is a gem, full of tricks that feel well ahead of their time: a building facade sports a spooky face, objects move about on their own, and a giant troll terrorizes an unfortunate traveler. In one segment, a dinner spread prepares itself via stop-motion animation, calling to mind the similar food hijinks Jan Svankmajer would play in his films more than half a century later. Breathless advertisements from the period (included in the bonus gallery on the disc) play up the wonders of its cinematic tricks. Another particularly interesting inclusion here is the Alice comedy Alice’s Mysterious Mystery! (1926), from a pre-Mickey Walt Disney. Mixing animated characters with the series’ titular, live-action heroine, this is surprisingly the Halloween-themed collection’s only truly dark short. In it, Alice and her cat pal investigate a shady group that’s kidnapping unsuspecting critters and grinding them down into sausage. Halloween Haunts' indispensable booklet – which includes brief essays on each of the set’s shorts – surmises that the bleak sense of humor in the cartoon was the result of overworked animators and a blown deadline, which would certainly explain the sort of fever dream on display here. Quite a few early cartoon stars make appearances here, from Koko the Clown (twice), to Mutt and Jeff and Felix the Cat. You’ll find plenty of goofy ghosts and dancing skeletons throughout – there's lots of similar flavor to Ub Iwerks’ iconic Skeleton Dance – which is all appropriate for this ghoulish season. 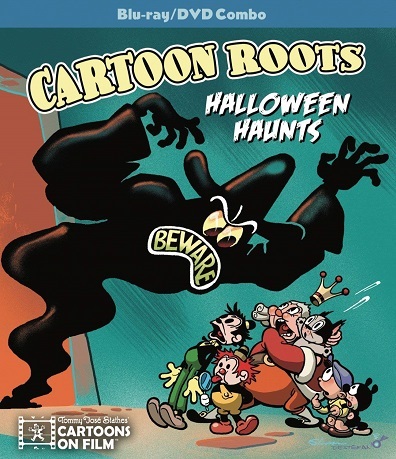 Cartoon Roots: Halloween Haunts is not only a well-curated collection of kooky cartoons, but a fascinating piece of ephemera for early animation fans. Not only are the restorations outstanding, but the extra context provided in the set’s essays and scanned artifacts is enlightening. This comes highly recommended. wow !! My favorite cartoon characters are all there!